Lawrence Abu Hamdan is an artist. 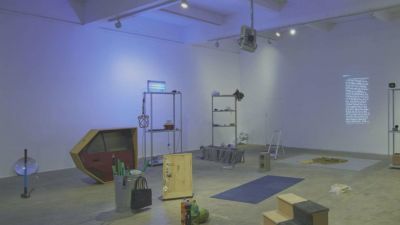 Lawrence Abu Hamdan, a solo exhibition presents a new co-commission by the Beirut-based artist and ‘private ear’. Featuring three newly designed sound instruments, over ninety sourced objects and an audio work, Earwitness Theatre (2018) explores the political effects of listening through the hallucinatory world of the earwitness. The new commission is presented alongside Abu Hamdan’s recent film Walled Unwalled (2018), which together develop the artist’s ear-witness investigation into the Syrian regime prison of Saydnaya, which the artist was invited to carry out in partnership with Amnesty International and Forensic Architecture, Goldsmiths University, London, as part of a broader enquiry.